The Traders Action Zone (TAZ) is a buy and sell zone on a stock chart that swing traders can use to identify possible reversals in a stock. First of all, let's take a look at all of the different types of traders involved in the stock market when looking at a daily chart. Now you can see where you fit into the big picture of this animal we call the stock market! Ok, I forgot to mention the day traders that make up each of the individual candles but I think you get the point. It doesn't matter whether you use SMA's or EMA's. There is little difference between the two so don't get caught up in the variations. 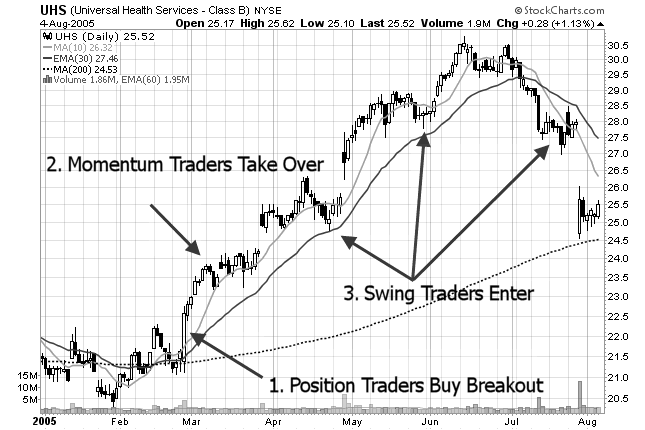 We are just using these moving averages to create a zone that we will find our entries for long and short positions. We'll cover the entries (and exits) on a separate section of this site. The answer is no. There isn't any trading strategy that will make you a consistently profitable trader. Sorry to disappoint you. The only thing that will enable you to consistently pull money out of the markets is you. You must be able to take losses. You must be able to take your profits. Put simply, you must be able to control the emotional and psychological problems that prevent success.